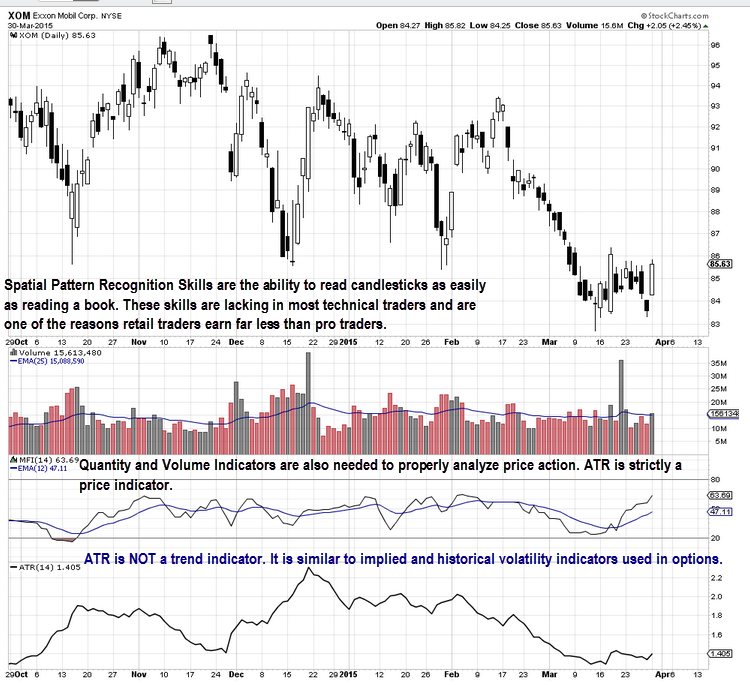 ATR can be highly useful for technical traders who trade stocks, and stock or index options. It can work similarly to implied volatility and thus is particularly useful for options traders. ATR works on stocks, ETFs, and indexes providing valuable information about the magnitude of price action. Magnitude in this instance means the size of the candlesticks both individually and as a group, or in a trend run up or down. Below is a chart example of XOM with a daily view of candlesticks, Volume with an Exponential Moving Average EMA, Moneyflow Index MFI which is a flow of funds indicator, and the Average True Range ATR indicator. One of the aspects of ATR that can be a challenge for new technical traders is to understand how to interpret ATR, and how to use this indicator optimally. ATR is not following the trend of the stock, although it may at times appear to be doing so. Its line can often contradict the direction price is moving. What ATR expresses is how long the candles are and the magnitude of the price action at that time. When ATR is low on the chart it means that price is compressing, or in a resting phase with smaller candles to a very tight candle formation. In this instance the combination of price action, Volume, MFI, and ATR tells the technical trader that this stock is attempting to bottom at this price level. This is hugely useful for traders who often find themselves trying to sell short, and then end up in a stock that is moving up rather than down. When a stock is in a correction phase due to fundamental value shifts and business contraction cycles, selling short can be lucrative. However once the stock reaches the “Buy Zone” of Dark Pools the stock is a much higher risk for sell shorters, as often times the Dark Pool orders will start triggering again at or near that prior Buy Zone price level. XOM is showing that pattern at this time. Volume surged on a High Frequency Trader HFT failed attempt to force the stock to move down, as Dark Pool giant lot and larger lot orders triggered against the HFTs. ATR will remain low on the chart as price moves sideways in a flat basing style bottom formation. Meanwhile MFI is showing flow of money into the stock. Volume over the past 8 days to the upside is higher than to the downside even while price does not run up, but maintains a sideways action with far less volatility than this stock has shown in the recent past. December was a volatile price phase as the stock moved in a Trading Range. Learning to use the more advanced and sophisticated indicators such as ATR and MFI requires some time and patience. However the benefits of adding a few of these indicators to your trading tools can reap huge financial rewards over time.